Add items to the cart by scanning the product, searching from the KRISP POS, or clicking on the hotkeys. Once the items are on the cart, you can alter the quantity, discount, or sales price if needed. You can click on more options to change other sales attributes. You will see the checkout screen. Make sure the Sale tab is selected. Hint: The transaction type always defaults to sale. Enter the tender amount. You can do a split-payment if the user will use more than one payment method (e.g. part-cash, part-credit card). Read more about split-payments. Click the Add payment button. On tendering the cash, any change amount will be indicated on the cart. Print, email, or email and print if a receipt is required. After doing a sale, the application will automatically re-direct you to the initial screen and show an empty cart so you can do the next transaction. A deposit allows your customer to reserve items by setting up an installment type payment. Typically, the customer will not receive the reserved item until the full price has been paid, but this depends on your store's preferences. Search for a customer to add to the cart. Click on Proceed to pay button. Enter in the tender amount. Click the Add payment button. Print or email the receipt if needed. Scanning the transaction barcode: Enter the customer name in search bar, and then click the transaction from the transaction listing. Using the search bar: Enter in the deposit transaction number, then a list will show up where you can look for the customer name. View transaction: After searching for a customer, click the open popup icon . to view more details, and then click the 'View transactions' button. Once the deposit is on the cart, click on the Proceed to pay button. A layby allows your customer to pay installments for items in at least two installments. Typically, the customer will not receive the item until the full price has been paid. Click on the Proceed to pay button. Using the search bar: Enter in the layby transaction number. View transaction: After searching for a customer, click the open popup icon to view more details, and then click the 'View transactions' button. Once the layby is on the cart, Cick on Proceed to pay button. Click on Add payment button. A customer can do an on account transaction, only if they are set up as an on account customer with available credit, and are not 'on hold'. 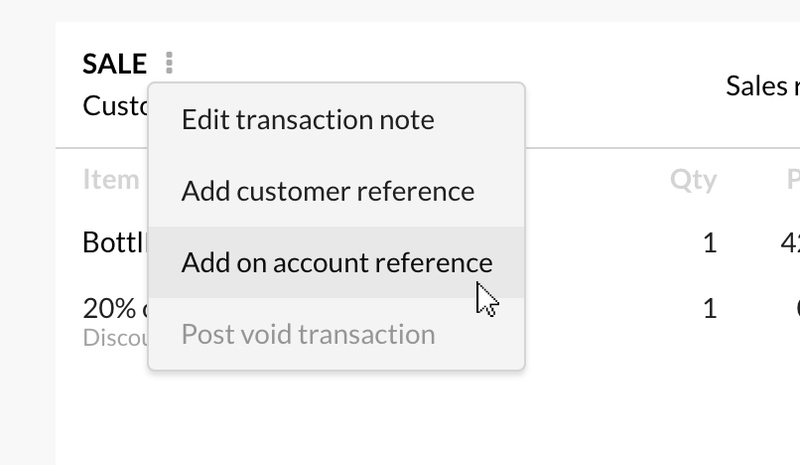 Click the ellipsis icon beside Sale and select the Add on account reference option, i.e. the person picking it up. Select the reference (if the account reference is not listed below, the customer is not elligible for an on account transaction). Hint: On account contacts are added to the on account reference by the admin. Click the Save button on the popup. Select the On account tab. This tab is only clickable when you have selected an on account reference in the cart. Enter in the tender amount. If the customer doesn't have enough credit amount, the transaction will not go through. Release note: This feature will be available in a future release. A pre-order can be recorded in KRISP POS for items before they're available for purchase in-store. All pre-order transactions must be paid in full. Items are then reserved for the customer once they're available in the store for pickup or shipping. Note: You need to specify that the items in the order are to be picked up or shipped at a later time. Click on the item name on the cart. Click on the Delivery details tab. If you choose None, proceed then with making the delivery status to Pending fulfilment. If you choose Pickup in-store, ensure that the delivery status is set to Pending fulfilment and the Pickup location has been selected. If you choose Shipped, proceed then with making the delivery status to Pending fulfilment, and shipping details are entered. Click on Update to cart button. Repeat this process for each item on the transaction. Note that address details will automatically be populated with the customers default address. Print or email the reciept if needed. Quotes can be recorded in KRISP POS when you need to provide an agreed price for your goods and services to customers. A Quote can later be turned into a Sale by retrieving the Quote and making a payment. Click Proceed to pay button. Make sure the quote is in the cart. Reserved can be recorded in KRISP POS if you allow customers to reserve items without making a payment. In the KRISP POS, selected the item the customer wants to reserve. Make sure a customer is added to the cart. You will be redirected to the checkout screen. Click on the Reserved tab. Retrieve the reserved transaction using the search bar. Once the transaction is on the cart, click Proceed to pay.